Once you have picked your products please follow the procedure set out on the website. Please make sure your information is accurate. Each order shall be an order to purchase goods subject to our terms and conditions. We will not be bound to supply any goods ordered until we have notified you of acceptance of your order. We are entitled to reject any order and will notify you of any such rejection. Goods will normally be delivered within 3 working days of your order being placed. We offer free home delivery to orders over £20 within a 20 mile radius of Hens for Hire HQ. All other orders will need to be collected. Full payment for any goods ordered must be made by credit, debit card in advance of delivery (debit/credit card payments are accepted on orders over £20). 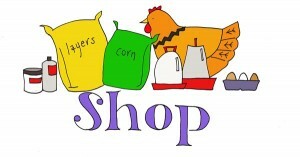 We also accept cash for goods purchased at Hen Pen. For incubator and hen hire we accept BACS payments, please contact us for information. All prices are in UK pounds sterling. All products are advertised for sale subject to availability. In the event of us being unable to supply the goods ordered, we will inform you as soon as possible. We try to ensure that the prices indicated on the website are up to date and accurate. However, we accept no liability for any errors and omissions and the final price of goods is the price in force at the time of us accepting your order. We offer all our customers a refund to their goods covered under the Consumer Protection (Distance Selling) Regulations 2000. We will refund the sums paid for the goods delivered to you as soon as possible. All goods which you intend returning to us must be kept in good condition whilst in your possession. If you wish to cancel a booking made on one of our courses, all courses bookings are non-refundable within 72 hours of the start of the course. If goods are found to be faulty or damaged upon delivery or not of satisfactory quality, please contact Claire at Hens HQ within days of receipt of the goods. We will, at our option, deliver replacement goods or refund the price paid.